Ivory Hoodie Sweater with Blue and Red Stripes, "Ivory Imagination"
From Peruvian artisan Nestor Yana comes this casual and attractive hoodie sweater. 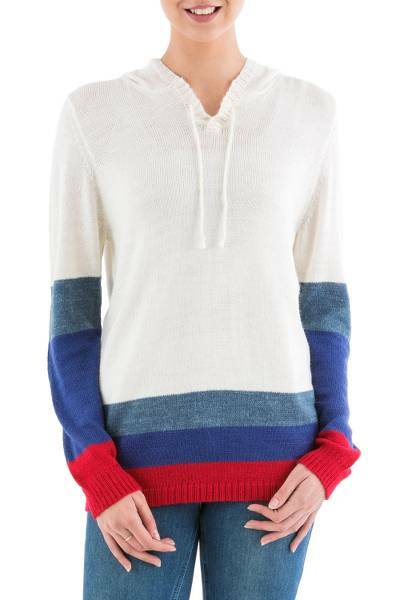 Made from soft acrylic, the sweater is ivory in color with bold stripes in red, indigo, and steel blue at the bottom and on the sleeves. Decorative drawstrings at the neckline complete the design. The hoodie is lightweight, making it a perfect choice for slightly chilly days. You can find hoodie sweater 'Ivory Imagination' by Nestor Yana in clothing categories such as Acrylic Sweaters and Hoodies Sweaters. Enjoy exploring these sections for other Novica treasures.